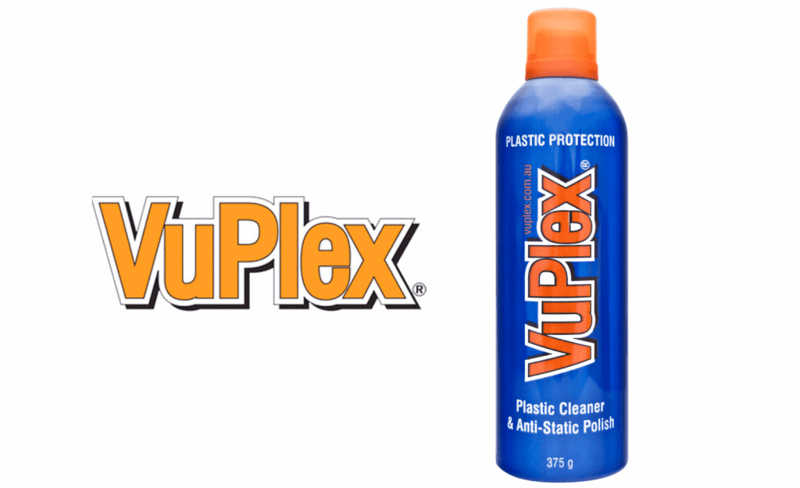 VuPlex® Acrylic Cleaner is an easy and effective way to clean, protect and polish all clear and coloured plastics and acrylics. For many Australians, conventional plastic cleaning products have proven less than satisfactory. Existing cleaners can be messy and hard to use, while providing substandard results. Many products contain chemicals or abrasives that can damage plastic surfaces. VuPlex® effortlessly removes stains that other cleaners don’t by applying a micro-layer of protectant and sealing the porous surface. The polished finish makes the plastic resistant to debris, oil, scratches and yellowing, while making fine scratches less visible. This innovative product is completely safe for use on food preparation surfaces and acts as a repellant against water and other contaminants like dust and abrasive materials. VuPlex® works on a range of acrylic and plastic products, preventing premature wear while helping them look their best. This helpful cleaner produces a shiny, cleaner, more lustrous finish with no smears or smudges. It makes colored plastics vibrant, clear plastics virtually transparent and leaves plastic paints gleaming like new. Vuplex® is recommended for use cleaning acrylic surfaces installed by Alternate Splashbacks. Users around the world describe VuPlex® as “amazing” and “impressive”. This leading cleaner is recommended thanks to its ability to produce a streak-free finish, powerful cleaning power and “gleaming finish”.